In the 19th Century, an artistic movement began. This movement began in the 1850s in France. It was known as Realism. In Realism, Romanticism was rejected. The Romanticism ignored the French Literature and dominated the French Art. Realists were against the exotic subject matter. Realism focused on portraying typical and real contemporary people and situations with accuracy and truth. How did Realism Art emerge? It was the first modern movement in history. Here, a traditional form of art and literature were rejected. This movement revolutionized painting. Realism Art has taken everyday subjects along with situations. This art focused on the contemporary setting of all social classes. It avoided Romantic emotionalism and Classical idealism. In fact, social realism also took the working class in art. So, Realism Art did not accept any artificiality. Its main aim was human emotions and relations. Realist painters replaced the traditional art with reality. They were not interested in idealistic images. Realistic Artists wanted to bring daily life into the canvasses. They rejected pictorial techniques. It was carried till the late 19th century. The movement resulted in the overturned monarchy of Louis-Philippe. Direct observation of the modern world was the basic theme of Realism. Two popular schools of French Painting in the mid of 19th century exemplified by J.A.D.Ingres and Eugene Delacroix. They gave a new way to art related to social value. In the row, Gustave Courbet gave this movement a title, Realism. It was the result of various different tendencies in France. Artists of the mid-nineteenth century became more concerned towards representing the true and real life and what they saw around themselves. This gave a new definition to the art. During the same time, France was under the influence of the philosophy of Auguste Comte (1798-1857). He was the founder of Positivism. He excluded all the metaphysical outlooks along with the speculative ones. So, art emerged that rejected the concept of creating ideal beauty and started searching for new subject matters from the current life and bring them into canvasses without any distortion. 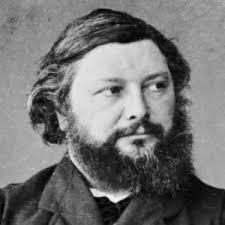 Gustave Courbet of France led this art movement. As the movement started, it gained popularity and was spread across the continent of Europe. Realism marked the starting of modern art. His art rejected the theatrical and classical style of French Academy. He laid stress on physical reality that he observed in his surroundings. He took scenes of country life in his art. Exposition Universelle of Paris rejected his two major works namely The Painter’s Studio and A Burial at Ornans in 1855. So, he withdrew all his 11 accepted submissions. Then, he displayed all of them privately at Pavillon du Réalisme. He also featured the working class in paintings. His subject of choice was farmers. Peasant subject was his favorite one. He also played an important role in establishing the Barbizon School where some artist came together and they challenged the Romanticism. He was sculptor, printmaker, caricaturist and painter. He was known to highlight the politics of contemporary France. The political cartoons displayed the exaggerated as well as subjective undertones. She had specialization in animal depictions. Most of her paintings have fields, countryside and farms settings. She is considered the most prolific female painter. 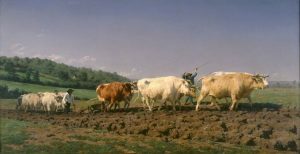 Since 1848, when her painting ‘ Ploughing in the Nivernais. won the I prize at the French Salon, she was taken as the most important person of Realism. He also played a significant role in Realism. He acted as a bridge to connect all the movements. Edouard Manet captured the impression of daily life. As the emergence of Realism in Europe, shortly the American artists too adopted this art. Realism directly convinced the artists for prominent contemporary art. It was simply a new focus on simple and ordinary things nothing else. Romanticism was characterized by only spirituality, personal feeling and emotion of the artists. But on the other hand, Realism was more objective where common places and everyday life is highlighted. So, basically, the work, as well as the lives of common people, were presented via paintings.